Ivory Coast President-elect Alassane Ouattara (L) and President Laurent Gbagbo. The world largest cocoa-producing country, the Republic of Côte d'Ivoire (otherwise known as the Ivory Coast), is on the brink of a civil war as President Laurent Gbagbo refuses to hand over power to the widely acknowledged winner of the November 28, 2010 presidential runoff election, Alassane Ouattara. The crisis has reportedly led to at least 170 deaths. Virtually every regional, continental and international organization recognizes Ouattara as the legitimate winner of the presidency. France, the former colonial power, and the United States have called for Gbagbo to step down after 10 years in office. The embattled president is accusing France and the United States of trying to run him out of the presidential palace. Ivory Coast, the hitherto oasis of stability and prosperity in West Africa, is now bracing for another civil war, the second in a decade. The 2002 civil war over perceived political marginalization effectively bifurcated the country into a rebel-controlled north and the government-controlled south. What is now at stake for all practical purposes is whether Ivory Coast can survive another civil war. Is a peaceful resolution of the current impasse possible? Is military force a legitimate intervention option? To answer, it is important to briefly underscore the root causes of the current quagmire. Despite the long history of "political stability" in Ivory Coast, the West African country had simmered under the weight of long-term political dictatorship and deep-rooted religious and ethnic jingoism. The long-term benign dictatorship of the independence struggle hero, late President Houphouet-Boigny, stifled political space, rewarded cronyism and played one ethnic group against the other. It is instructive to note that virtually all the key actors in the political crisis in Ivory Coast in the last 15 years were once late President Houphouet-Boigny acolytes. President Gbagbo, incoming President Alassane Ouattara, former President Bedie and former military leader Guei got their start under the expansive patronage of Houphouet-Boigny. Ivory Coast's prominent position as a leading world producer of cocoa led to higher standards of living compared to poorer neighbors. Migration from these poorer, predominantly Muslim neighboring countries such as Mali, Burkina Faso, Niger and Chad was inevitable. This set the stage for the current religious and ethnic divide in Ivory Coast. The northern part of Ivory Coast became predominantly Muslim, while residents of the southern part are predominantly Catholic and animist. No matter the outcome of the current political standoff, Ivory Coast faces long-term odds regarding its corporate existence due to its combustible ethnic and religious divide. A generation of Ivorians has now grown up on the toxic politics of ethnic and religious extremism. The "Ivorite" or the so-called "Ivorian-ness" is an albatross hanging over Ivory Coast and is at the heart of Gbagbo's resistance to obvious electoral defeat. A successful resolution of the current imbroglio in Ivory Coast requires three important, simultaneous steps. These steps reflect a genuine sensitivity to the country's checkered history, an understanding of the long-standing big-man politics, and a careful recognition of a citizenry deeply polarized along ethnic and religious divides. First, the international community must remain firm on President Gbagbo quitting office so that President-elect Ouattara can legitimately assume duties. The electoral math favored Mr. Ouattara in any free and fair election. To keep pressure on Gbagbo and his entourage, the international community should continue current efforts of investigating and possibly prosecuting all proven cases of human rights violations, torture and murder arising from the impasse. The international community should also beam their searchlight on Ouattara and his supporters. Second, Ouattara must demonstrate that he will run a broad-based national unity government that incorporates representation from all parts of the country. 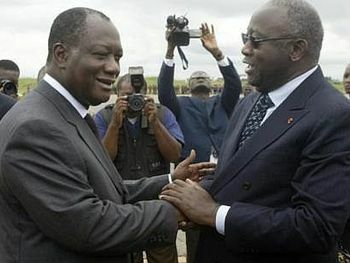 It is no secret that the power base of Ouattara is in northern Ivory Coast. The hasty naming of the former prime minister and former rebel leader, Guillaume Soro, reportedly to the combined post of prime minister and defense minister, sends the wrong signals in a country battling ethnic tensions. The charismatic Soro reportedly enjoys a reputation for hard work and commitment. However, the Ouattara government at the barest minimum should have the prime minister, the defense minister, the finance minister, the foreign affairs minister and the interior minister reflecting the multi-ethnic, multi-religious and multi-geography realities of present-day Ivory Coast. Key commanders of the armed forces should also come from different parts of the country. In addition, key positions in the presidency and the diplomatic service should come from different parts of the country. Third, the international community should invest in a post-Gbagbo deepening of population-based democracy, good governance and rule of law in Ivory Coast. The future of the country will depend on a government deeply committed to basic human rights, equity and justice. Specific investments should be made by the international community on an independent judiciary system, a free press, vibrant civil society, modernization of representative armed forces, quality educational opportunities for young people, and the creation of stable macroeconomic policies that build upon the legendary entrepreneurial tendencies of the Ivorian people. A military resolution of the Ivorian impasse should be avoided, as a military intervention would be extremely unwise against the background of a deep-seated rot in the political system and the long-standing polarization of ordinary Ivorians along ethnic, religious and economic lines. Both Gbagbo and Ouattara today represent deep-rooted tendencies in the country. Ignoring this reality will be a fatal mistake. The way forward is for the soundly defeated supporters of Gbagbo to be convinced of peaceful coexistence in an Ouattara presidency. Seating Ouattara as the president will be only the first stage of a long-term reconciliation process. A deeply divided Ivory Coast may not survive a forceful imposition of a freely elected president. The regional economic bloc, ECOWAS, the Africa Union, the United Nations, the European Union, France and the United States have stood firm regarding the installation of the rightful winner of the presidential runoff. Now is the time to peacefully nudge Gbagbo out of the presidential palace and into a safe retirement. This nudge can be accelerated by verifiable, confidence-building measures by the rightful winner, Ouattara, regarding his intentions for a broad-based government of national unity reflective of the ethnic, religious and geographical reality in Ivory Coast.